LaMorinda: The next wine region? The Bay Area is blessed with the richest wine regions in California. LaMorinda wants to be one of them. Granted, there’s no celebrated wine trail yet — but the growers in Lafayette, Moraga and Orinda have big plans for the future. “We believe that we can have really good wines here,” says Susan Captain with Captain Vineyards in Moraga, “and that we can offer people around here and in the community the taste of our land.” Captain is the president of the LaMorinda Winegrowers Association — a consortium of 100 area growers. She runs the only green winery in Contra Costa County and offers classes in wine growing and wine making for adults 21 and older. She was interviewed recently by one of my students, Tracy Vasquez, at St. Mary’s College. St. Mary’s has its own rich wine history, of course, with the Christian Brothers making some of the most celebrated wines of the 20th Century. For Captain, an important aspect of growing grapes in Moraga is the opportunity to educate the public. The Moraga Valley has a rich agricultural history. Del Monte once grew thenation’s largest Bartlett pears here, and you can still see groves of pear trees that provide fruit for the town’s annual Pear Festival. Moraga’s winemaking history goes back to the early 1800s. When Prohibition started, the vines were ripped out and the land started to be developed for residential purposes. “When it (Prohibition) ended in the ’30s, people started looking for cheap available land with a nice climate for growing grapes again — and they discovered Napa and Sonoma. If things had worked differently, we might actually be the larger wine growing region.” Parker and his wife, Shari Simon, sell their wines to several local restaurants including Michaels in Moraga. They make pinot noir (using grapes from three Moraga vineyards) and Sangiovese (using older vines in the area) and offer several varietals on their website and through their wine club. If you visit the LaMorinda Winegrowers website you’ll see a number of other wineries in the area. Deer Hill Vineyards makes cabernet from the grapes on its 1-acre property in Lafayette. Bullfrog Creek won a bronze ribbon for its 2009 cabernet, made on 15 acres in Moraga’s Rheem Valley. Eagle Hill on Bollinger Canyon Road makes a meritage blend of 80 percent petit verdot, 15 percent cabernet sauvignon and 5 percent cabernet franc. Collectively, the winemakers are pushing for LaMorinda to be recognized as an American Viticulture Area. It would allow them to brand their bottles with the LaMorinda name. You can taste LaMorinda wines at the upcoming Moraga Community Fair from 11 a.m. to 4 p.m. May 12. The fair features live music and wine tasting along with several family attractions. 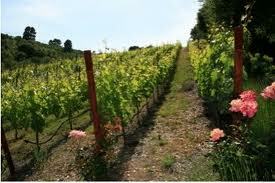 If you’d like to find out more about LaMorinda wines, log on to www.Lamorindawinegrowers.com. To hear an NPR radio show produced by students at St. Mary’s College in Moraga, check out http://kcbx.org/mp3archive/audlog.